Medical Diagnostic Industry Growth Prospects- Bizwit Research & Con. The global Medical Diagnostic Industry has undergone through various major transformations which are driven by the innovation in devices and the along with the introduction of the Internet of Things (IoT). the industry is now being shifted towards wearables and personalized medicines in order to cater effectively. Meanwhile, factors such as aging populations and the increase in chronic diseases are also driving the growth of the global medical diagnostic industry. key players in the Medical Diagnostic industry are focusing to offer improved image quality and better analysis. Emerging 3D and 4D imaging technologies enable enhanced visibility of diagnosed images. Moreover, data integration through cloud enables faster availability of images to multiple people. 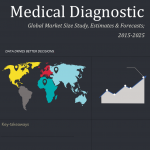 Some of our top selling medical diagnostics research reports include Global Infertility Treatment Market, Global BioElectronics Market, and Global Next Generation Cancer Diagnostics Market and so on. Global Canabbis testing Market valued approximately USD 822.0 million in 2016 is anticipated to grow with a healthy growth rate of more than 12.5% over the forecast period 2017-2025. Global Hernia Repair Market Size study, By Hernia Type (Inguinal Hernia, Incisional Hernia, Femoral Hernia, Others), By Mesh Type (Biologic Mesh, Synthetic Mesh) and by Regional Forecasts 2017-2025.